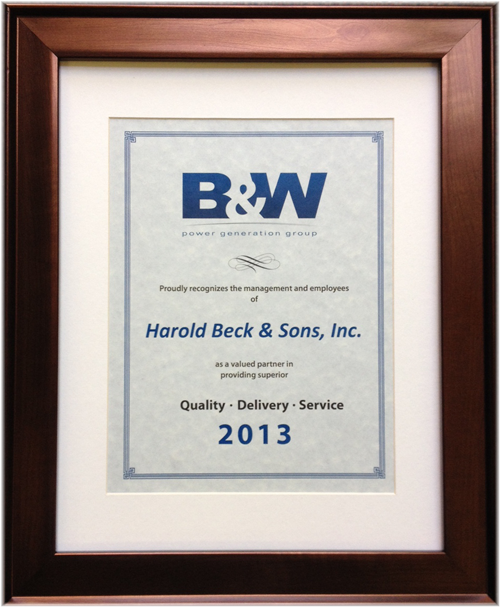 The B&W Power Generation Group has again presented Harold Beck and Sons, Incorporated with its Supplier Award, this one for the year 2013. The award, presented by B&W for the fifth consecutive year, is based on how well the supplier company performs with respect to quality, delivery and customer service. Beck, a long leader in electric actuators was not only recognized for its high quality but was also honored by B&W for a score of 100% in both on-time delivery and ease of doing business.